Saudi Arabia announces end of Yemen bombing. 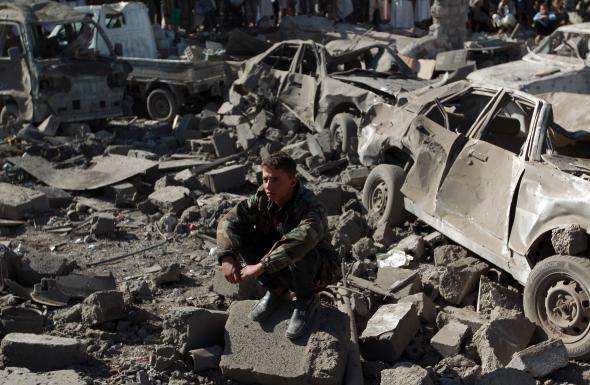 A Yemeni man wearing a military fatigue sits at the site of a Saudi air strike on March 26, 2015. Saudi Arabia announced an end to its nearly monthlong bombing of Yemen on Tuesday and says it is now pivoting to pursue a political resolution to the ongoing turmoil in the country. The Saudi-led campaign was launched after the Houthi rebels, suspected of receiving Iranian support, successfully sent the U.S.–backed government on the run from the capital city into exile, and after gobbling up large swaths of territory looked ready to take over functional control of the country.